I can so relate to this TR. We went with our 18 month old last March and are heading back in May with a very wriggly 2 year old! DD was amazingly well behaved on the flight last time but I am dreading it so much more this time round, it’s a long old time in a metal tube! Can I ask what sort of toys you took on the flight to entertain Charlotte as I am starting to think about it? Will be following along with interest for all your tips. Thanks for sharing! It feels like a whole new ball game doesn't it! 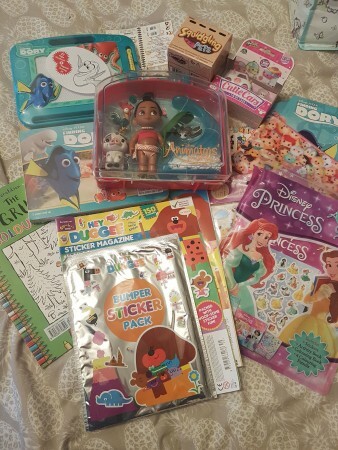 I'll put a pic in below of some stuff I bought to take on the plane, but her favourite things she ended up playing with were some little Shopkins cars I got in the sale in The Entertainer, blind bags with little babies/pets (tat basically) magna doodle, a funny faces reusable sticker book and fuzzy felts. She loved being able to sit with her kindle too, as I don't allow her to have it much at home so it was a real novelty. I'm sure your little girl will be brilliant again! Finally going to start this! What a star Charlotte was on the flight!